Can Chihuahua Puppies Have Adult Canned Food With Their Dry Puppy Food? Chihuahua puppies need puppy, not adult, dog food. 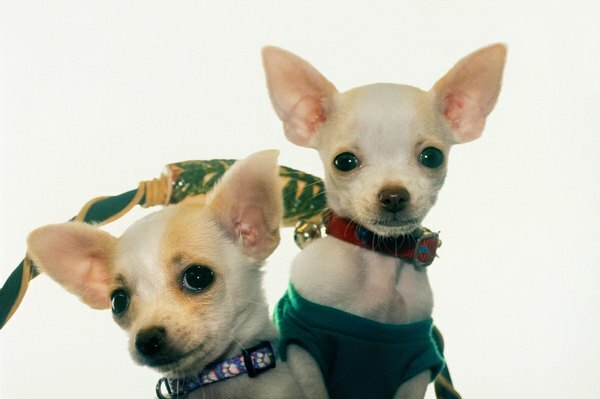 Chihuahua puppies are tiny, lively bundles of tail-wagging energy. Your puppy should be the same way. You want to keep her healthy, tail-wagging and lively by feeding her the most appropriate food for her body’s needs. Adult dog food doesn’t have what she needs. Your Chihuahua is a small-breed dog and she’s going to stay small. Bags of premium puppy kibble come with feeding guidelines printed on the back, and this includes how much food your pup should eat, as well as how often she should eat. In general, she should eat nearly two times as much food per pound of her body weight. However, she’s going to go through picky and “glutton-pup” phases. These are timed with growth spurts and developmental changes. If your canine friend is between 7 and 16 weeks of age, feed her three times every day. Time her meals at about the same time as yours. Calculate how much you should scoop into her bowl from the printed guidelines, which may specify either per meal or a daily total. Even if she hasn’t finished every bit of kibble in her bowl, remove it after about 15 minutes. She shouldn’t be allowed to “graze,” or she’ll become overweight. Your Chihuahua puppy has very specific growth and dietary needs that canned adult dog food won’t provide for her. For that reason, mixing adult food with her puppy kibble may prevent her from getting all the benefits that dry puppy kibble provides, leading to potential health issues as she matures. Because she’s so small, she will reach adulthood sooner than a larger dog. If you want to give her canned or moist food, ask your vet for his recommendations on canned puppy foods for your Chi-puppy. Feeding a puppy is similar to feeding a human infant. Both need high levels of specific nutrients so all their body systems grow and function properly. Your Chihuahua needs human-grade meats, particularly beef and chicken, in her kibble. Steer clear of bags that list only generic “meats” in their ingredient lists. She also needs whole grains in her food. Look for descriptions of the fat in the kibble. This should be listed as vegetable oil or chicken fat. Your Chihuahua puppy shouldn’t begin eating adult dog food until she is about 1 year old. However, it isn’t a good idea to simply stop feeding your Chihuahua her puppy food one day and start her on her adult food on that same day. The changeover will wreak havoc on her tummy and intestinal system, leading to several unsavory issues, such as constipation, vomiting or diarrhea. That's not good. Therefore, slowly convert her to her new adult food. Decrease the amount of puppy kibble by about one-eighth of a cup and mix in one-eighth of a cup of adult food. Over successive days, continue decreasing the amount of her puppy food and increasing her adult food until she is completely converted to the adult food. Do Cats Need Canned Food? What Does Byproducts in Dog Food Mean? What Supplements Need to Be Added to Homemade Cat Food?